“Easy Ed’s Variety Hour” returns tomorrow night at 6:00 PM Eastern (US). Please tune in! A first! I’ll be spinning live at River Gods two weeks in a row—tonight (10/27) and next Wednesday (11/3). Thanks to Jason Beek, P.J. Eastman, and the folks at River Gods for having me back. Stop by for a guaranteed fun time! The music starts at 9:00 PM. 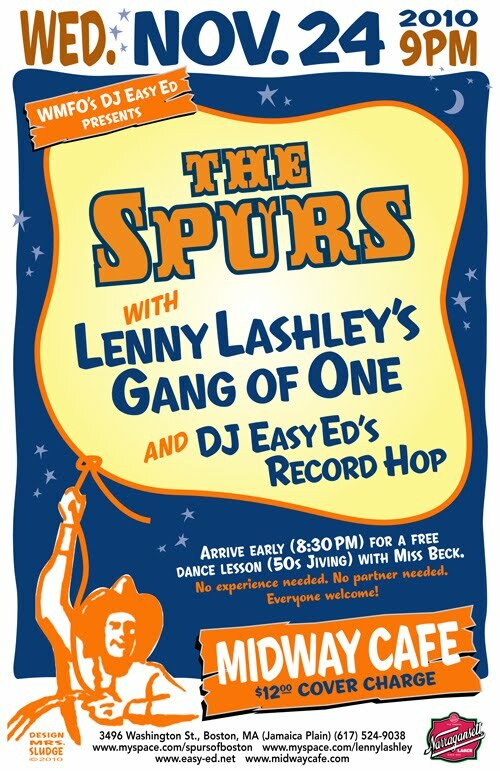 11/24 (Thanksgiving Eve): DJ Easy Ed presents Boston’s legendary western swing and honky tonk combo the Spurs, along with Lenny Lashley’s Gang of One and yours truly spinning the dance numbers! Speaking of dancing, come early for a free lesson with Miss Beck. Come on Down and Bop Around! 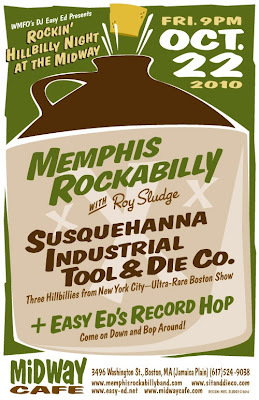 Comin’ your way: Another episode of “Easy Ed’s Variety Hour”—two hours of Rockabilly, Hillbilly, R&B, and Rock and Roll! I’ve got tons of great stuff lined up to play for you, but send along your requests and I’ll do my best to play them too! **Can’t listen live? Visit http://www.easy-ed.net/ for information about archived shows. Big thanks to DJ Beck for spinning a cool bonus hour of tunes at the end of my last show. See below for a list of what she played. On September 22 I’ll be the guest DJ at River Gods in Cambridge for Primitive Sounds night, alternating sets with Jason Beek and/or fellow ‘MFO DJ P.J. Eastman. 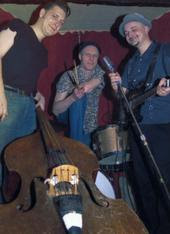 The music (rock ‘n’ roll, blues, old country, rockabilly, and more) starts at 9:00 PM. Hope to see you there! 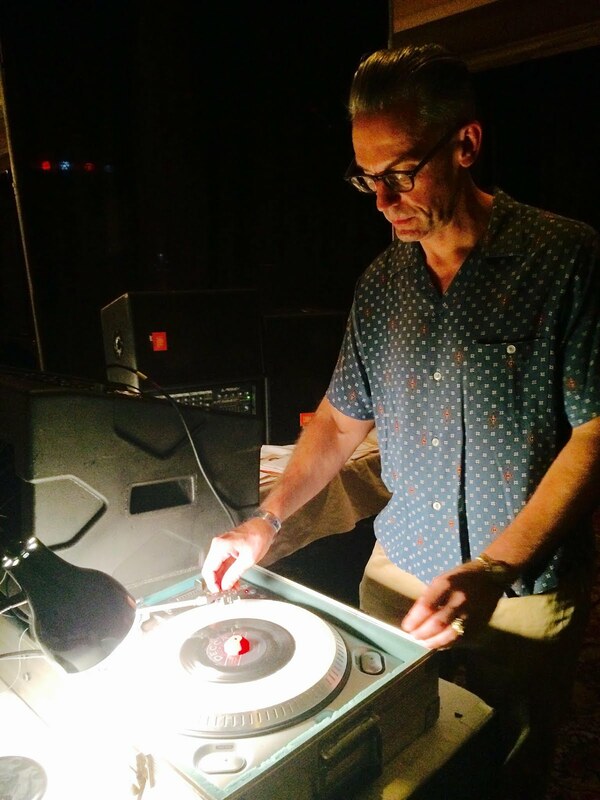 September 29: The Dusty 45s (all the way from Seattle) and the Throttles (Providence) will play at the Midway Café. Ariane and Beck, the ladies who give the dance lessons at many of my events, are putting this one on. Be sure to check it out! DJ D-Bag (Portland, ME) will be spinnin’ the platters that matter. P.S. Below is a list of what I played on the last show. If you missed the show you can listen to the archive version anytime. Visit http://www.easy-ed.net/ for details. Deke Dickerson and The Modern Sounds “Mexicali Rose” from Live at Duff’s (Major Label Records) – For Tony! Wanda Jackson “I'd Rather Have a Broken Heart” from Right or Wrong CD COMP (Bear Family Records) – Capitol Records 1960/Coming to Johnny D’s in Somerville 10/7. Crazy Joe “Marianne” from Various: Viva Las Vegas Rockabilly Weekend #9 (VLV) – See Crazy Joe at the Red Hot and Blue Festival in Montreal this weekend, along with Deke Dickerson, Little Rachel, Barrence Whitfield and the Monkey Hips, and many more! Last night's show started early--I warmed up instro-only style before the show officially started at 6:00. Here's the list. The archive MP3 will be up at http://www.easy-ed.net/ later this weekend. I love everything I played of course, but this one is my song of the week. These guys are absolutely amazing. Check 'em out! 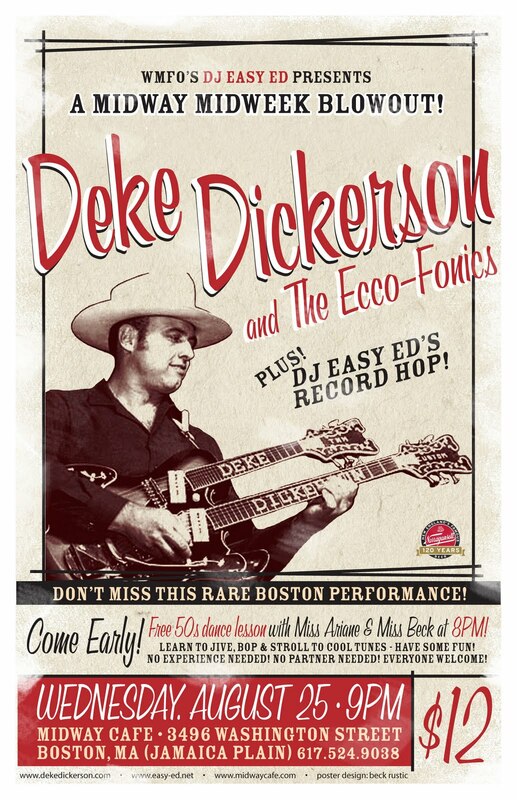 Boston-area folks: Be sure to catch the Deke Dickerson at the Midway on 8/25. It'll be a Huge Rockin' Show fer sure!I appreciate your continued interest. 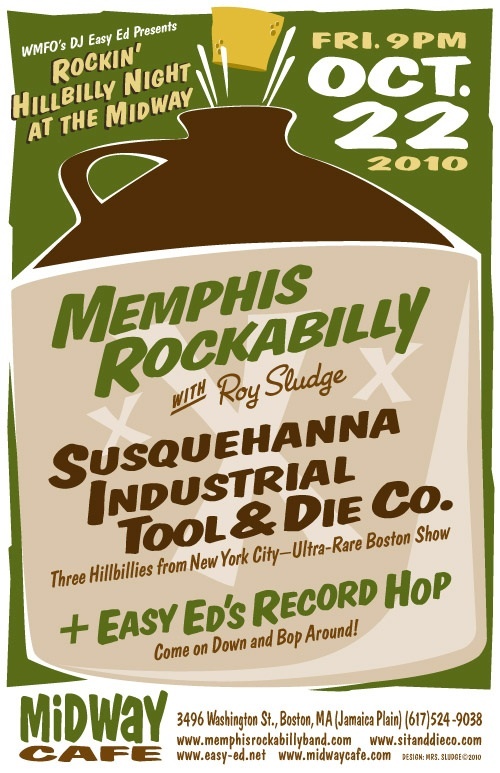 “Easy Ed’s Variety Hour” returns this Friday with two large, charged hours of Rockabilly, Hillbilly, R&B, and 50s, early 60s Rock ‘n’ Roll! Please tune in, and request ‘em if ya got ‘em (dj_easy_ed@yahoo.com). I’ll do my best to play ‘em (if thems the kinda ‘ems that’s gems). June 30: I will be the guest DJ at River Gods in Cambridge for Primitive Sounds night. Thanks to Jason Beek, P.J. Eastman, and the folks at River Gods for the invitation. Please stop by! The music starts at 9:00 PM, but come early for good eatin’. 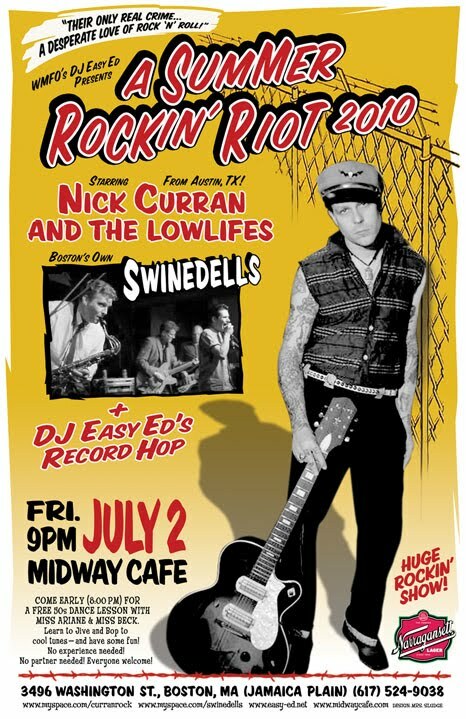 July 2: Don’t miss Easy Ed’s Summer Rockin’ Riot, starring Nick Curran and the Lowlifes (from Austin, TX) and Boston’s own Swinedells. 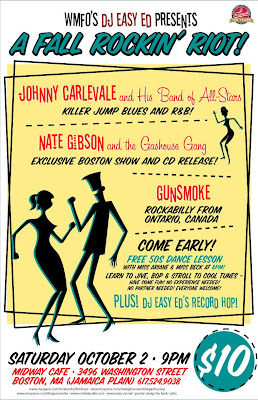 Plus Easy Ed’s record hop and a bop/jive/stroll lesson with Miss Ariane and Miss Beck. This will be a huge rockin’ show! (See the cool poster, attached, designed by Mrs. Sludge.) Sadly, I’m told it will be the final Swinedells appearance. Please come out and bid this fantastic band a fine farewell—and have a great rockin’ time! P.S. Below is a list of what I played on the 6/4/2010 show. An archived MP3 is available for free download at www.easy-ed.net. Also, if you'd like to be removed from my mailing list just let me know. Elvis Presley “Follow That Dream” from Elvis at the Movies (RCA Records) — RCA Records 1962/From the soundtrack to “Follow That Dream.” He also sang “On Top of Old Smokey” in that film. I spared you that. Deke Dickerson “Hot Rodder's Lament” from My Name is Deke CD (Hightone Records) — www.dekedickerson.com/Coming to the Red Hot and Blue Festival in Montreal on 9/3. 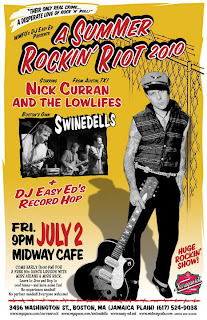 Nick Curran and the Lowlifes “Reform School Girl” (Eclecto Groove Records) — July 2: Don’t miss Easy Ed’s Summer Rockin’ Riot, starring Nick Curran and the Lowlifes (from Austin, TX) and Boston’s own Swinedells. 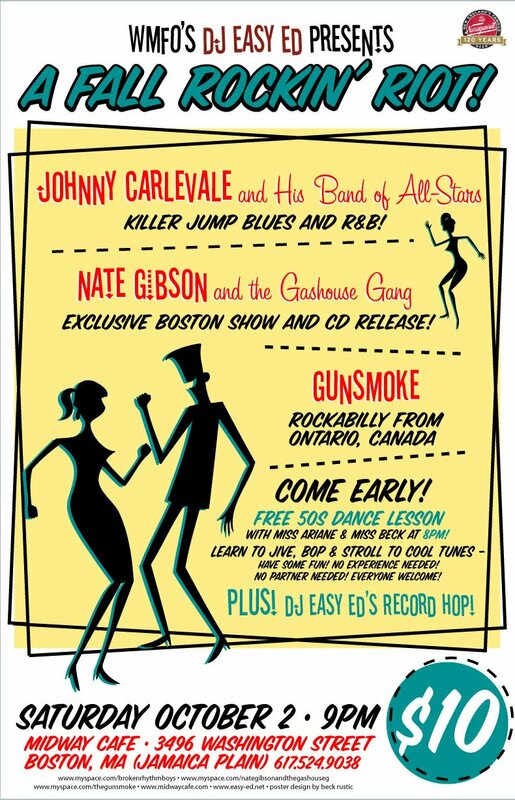 Plus Easy Ed’s record hop and a bop/jive/stroll lesson with Miss Ariane and Miss Beck. This will be a huge rockin’ show! The Swinedells “Greasy Kid Stuff” from Unreleased single from their forthcoming album. (Well, it better be forthcoming, dammit.) (N/A) — www.myspace.com/swinedells See them 6/11 at the Tavern at the End of the World in Charlestown and on 7/2 at the Midway Café.